If you rely on messaging apps to remain in contact with your family members and friends, then you may have to switch back to old-fashioned text messaging service in matter of weeks due to a new law currently going through Parliament. 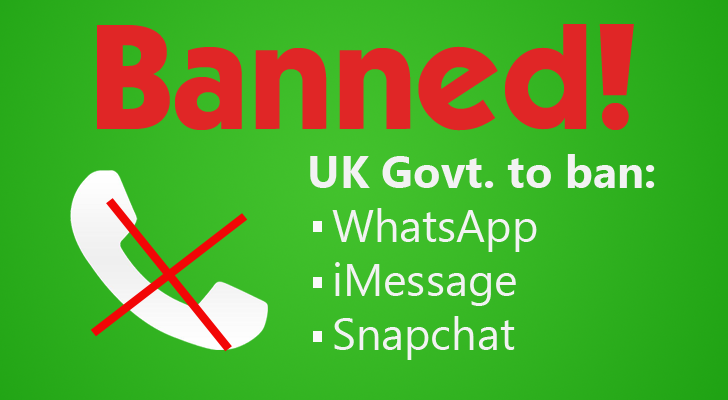 The popular messaging applications, including WhatsApp, Snapchat, iMessage and Facebook Messenger, could all potentially be banned in the UK under the controversial 'Snoopers Charter'. The Investigatory Powers Bill -- the so-called Snoopers Charter -- mentioned in the 2015 Queen's Speech, would allow UK government to eradicate instant messaging apps that refuse to switch off end-to-end encryption from their services. Earlier this year in light of the Charlie Hebdo shootings in Paris, Prime Minister David Cameron hinted at the crackdown when he claimed that he would ban encrypted messaging apps like Snapchat, WhatsApp and Messenger unless they didn't comply with new surveillance compliance. Cameron was quoted as saying, "In our country, do we want to allow a means of communication between people which […] we cannot read?" "My answer to that question is: 'No, we must not'." If the Snooper's Charter goes ahead, it requires Internet service providers, mobile phone companies and technology firms such as Apple, Facebook, Google and WhatsApp keep a record of all of your activities, including all your Google searches, your Facebook chats, WhatsApp messages and SnapChat videos. Home Secretary Theresa May has warned that the Snoopers Charter or Investigatory Powers Bill could be passed this Autumn. The future is looking troublingly uncertain in the UK for messaging apps like WhatsApp.